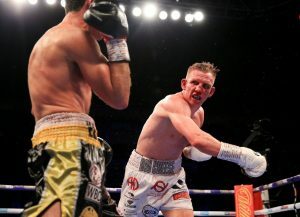 In the centre of the O2 Arena in London, Ted Cheeseman failed to appease the home crowd as he was beaten by Spaniard, Sergio Garcia, who retained his EBU European junior middleweight belt and shot himself firmly into the world title challenger stratosphere. Garcia came out swinging, looking like a man eager to use up some nervous energy, whereas Cheeseman seemed happy to block the majority of punches coming his way and tee off the occasional single, but accurate shot. Ted’s movement was exemplary in round 2. Though he didn’t throw near as much as his Spanish rival, his head movement was almost robotic and a positive sign for future, high-profile bouts. Garcia once again came out for the third throwing straight shots that he was struggling to land, but God loves a trier and the Spaniard clearly came to win his way, but his way was increasingly looking like an attempt to stop the Brit early, which never seemed likely. As the fight drew on into the middle rounds, it suddenly felt very reminiscent of Lewis Ritson’s European battle against Francesco Patera last year where he came unstuck and eventually lost despite all the hype. Garcia’s output, though not exactly hurting ‘The Big Cheese’ was forcing him further and further back. The crowd bayed for Cheeseman to go in for the kill but by round 8, all the Bermondsey native was doing was rushing in head first with the occasional, hopeful hook. The movement shown very early on was gone, though a flurry at the beginning of the eighth suddenly brought Ted back into some semblance of contention. Volume was king through the 9th, which looked as if Sergio held the crown. Through round 10, the away fighter really laid on an exhibition of shots, further bloodying the home fighter’s face that was becoming an increasing concern. Even the most ardent Cheeseman fans had to marvel at Garcia’s stamina. ‘El Nino’ had gone hell for leather for the majority of the fight and, despite the lack of experienced opposition in his resume, was proving his worth as an unbeaten fighter. Cheeseman became desperate and tried to line up his foe with his lead hand, ala Wladimir Klitschko, but then missed with his right. You can’t fault Cheeseman’s heart. He came out for the KO in the 12th, landing on numerous occasions but not powerfully enough to even buzz ‘El Nino’. With 60 seconds left the Brit landed three straight right hooks but Sergio shrugged them off and continued on. Only a robbery would save the Londoner. The final judge’s scorecards returned as, 119-109 (x2), 115-114. In a bad blood bout for the WBA ‘Continental’ light-heavyweight title, Craig ‘Spider’ Richards came out the victor with a 3rd round stoppage of Jake ‘The Blade’ Ball to improve his record to 14-1 (8KOs) and put him in line for some big fights from British to European level. The two men had to be separated by security at the weigh-in and the willingness to engage was evident once the first bell sounded. Richards scored a 10-8 in the final few seconds of round 1 when Ball, trained by Dominic Ingle, took a sharp counter-right from the ‘Spider’ and fell backwards. More of a flash knockdown but it still put Jake behind early on. Craig clearly came out for the next round enthused but perhaps relied to heavily on the hope that he would land the same shot again. 12-1 (9KOs) heading into tonight, ‘The Blade’ was leaving himself wide open for Richards’ instant replies and was knockdown once more towards the end of round 2, this time it looked as if he’d been saved by the bell. Already flying ahead on the scorecards you could forgive Craig for trying to box his way through the next eight rounds, but the man in black & red shorts was in search of the stoppage. With just over a minute to go of round 3, ‘Spider’ put Ball down for a third time and on this occasion the bell was too far away to save Jake. Ball tried to back away and survive for the rest of the round, but Richards landed every time he threw until the ref slightly abruptly stepped in and called it off. ‘‘I knew that fighting Jake, he’s a top, credible opponent and ranked way above me and I knew beating him was big statement for me; put the division on notice…I knew I had to beat a credible name to push on and get in the mix. British cruiserweight champion, Lawrence Okolie was marked to fight American, Shawn Miller but after a last-minute pull out, journeyman, Tamas Lodi, 20-11-2 was brought in and the fight proceeded as expected with Okolie on the front foot throughout, dropping the challenger twice in round two, and twice more in the 3rd before the referee waved it off. After such a successful 2018, Lawrence, now 11-0 (8KOs) will be hoping much, much bigger wins are ahead for the rest of 2019 and his next fight will be against current Commonwealth champion, Wadi Camacho as announced in the ring post-fight. Felix Cash scored a 1st round stoppage to move to 11-0 (7KOs) and claim the vacant Commonwealth middleweight strap. Abolaji was downed twice in the opening round, and on the second occasion he stumbled backwards as he tried to rise, forcing the referee to end the fight. Scott Fitzgerald improved to 12-0 (9KOs) in a keep-busy fight before he comes up against domestic rival, Anthony Fowler at the end of next month. ‘Fitzy’ needed less than six minutes to hand a beating out to 12-45-2, Radoslav Mitev and force the referee into waving of the bout in round 2. 24-year-old heavyweight prospect, Fabio Wardley shifted to 6-0 (5KOs) with a 1st round KO of Frenchman Morgan Dessaux, Morgan’s fourth defeat in five fights.